Kenny Jackett is certain Joe Mason will deliver the good for Pompey. The striker completed a deadline-day loan move from Wolves to Fratton Park until January. He becomes the club’s 10th signing of the summer. 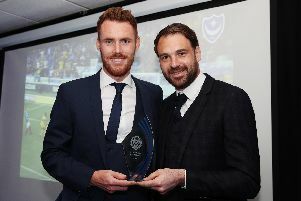 Mason, 27, reunites with Jackett having been signed by Pompey’s boss in Janaury 2016 when he was in charge at Molineux. The former Cardiff City forward has a proven goal-scoring record in the Championship, having netted 42 times in 185 appearances. He drops down to the third tier and Jackett is convinced the Plymouth-born talent will be a Fratton Park hit. The boss told the club’s website: ‘We worked together at Wolves and he’s a player who’s spent much of his career in the Championship. Mason did not arrive at Fratton Park in time to feature against Plymouth tomorrow.